Collaborative Learning Cloud | Learning, collaboration & decision-making solutions. CoursePeer is a revolutionary suite of cloud tools for varied environments. Highly scalable, fully integrated and mobile supported, these tools seamlessly offer learning, certification, intranet and long-term advanced performance management. 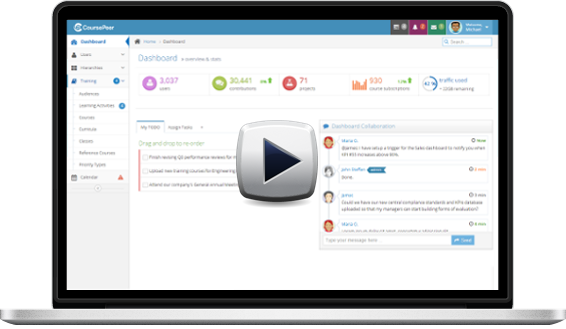 Seamlessly offer employee training, certification, intranet and long-term advanced performance assessment. Deliver content while accelerating communication with and among students. Student assessment is facilitated, as is accreditation. Allow healthcare institutions and hospitals to provide online training, certification and compliance for various settings. CoursePeer uses three distinct, yet fully-integrated, modules: the core suite of tools, a learning management system, and a collaborative decision making system. Each module is designed to oer the user a complete toolbox that can be used to accomplish organizational goals. In addition to the ability to create communities and departmental portals for employees, clients and partners, it supports multimedia and advanced evaluation forms to assess various performance levels and competencies. In addition, it allows for rewards and recognition for users. CoursePeer's backbone is cloud-based with bank-grade security. Its hands-free updates, managed hosting, availability, and scalability provides a strong infrastructure.